World’s most famous PC maker Lenovo has launched its first dual Mode Notebook in India. 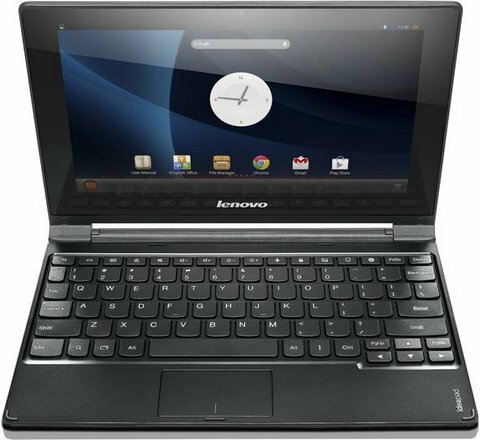 The Lenovo Ideapad A10 has 10.1 inch multi touch display with 1366 x 768 pixels resolution. It has three modes – laptop, stand mode and you can flip it up to 360 degrees. It weighs arous 1KG and has 10 hours of battery life. Specs are not much vigorous, Micromax has also announced Dual BOOT smartdevice dubbed as Canvas LAPTAB. IT runs on Android 4.2 Jelly bean OS and gains the strength from 1.6GHz quad core processor paired with 1GB of RAM. It comes with Accu-Type Keyboard and has integrated speakers. The Lenovo IdeaPad A10 is priced at RS 19,990 and is available at almost Exclusive stores.